Quite of an unexpected last minute trip using the last remaining holidays left for this year’s allowance, it does also mean this is the very last country in Europe as a continent I have not been. With it, I’ve completed all 51 countries that are as per-se, considered Europe, one way or another, although it is a trans-continental country with soil in Europe and Asia. So completing the Caucasus region coupled with Georgia and Armenia that we’ve visited just few months ago, it is coming closer the time to get farther to the big empty space in my travel map that is Central Asia now that East and South East Asia is almost fully completed as well. Baku, the capital of the country, and actually the only metropolis in Azerbaijan, contains almost every sight worth visiting in the country, together with the nearby natural attractions of the mud volcanoes and fire mountain, and the prehistoric hieroglyphs of Qobustan. Easy to visit it all in merely 3 days without any rush, so imagine that we calculated 4 full days for this trip, that was well an over-estimation, however we knew it. After all, Baku is not just next door from London, and flights are not cheap at all, so we rather enjoy a bit more time and discover other facts and corners outside from the touristy landmarks. 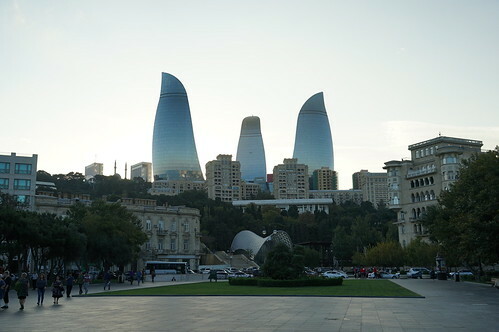 With a history dating back to the Stone Age, the true “modern” Azerbaijan and Baku itself as we know it today with its great architecture is the result of an idyllic location, cross-roads for centuries of trading between Asia and Europe, and Iran taking over its rule in the 10th century from the native Shirvanshahs for centuries, switching thereafter hands to Russia back and forth in the 18th century, including the Ottomans eager for this land, until the Russo-Persian War of 1804–1813 where it became irrevocably part of the Russian Empire and remained as such part of Russia until the Independence in 1918, however captured as part of the Soviet Union until the fall in 1990. The importance of the country and in special the area of Baku and nearby, with a dramatic rise in wealth, population and growth was influence by the discovery of oil. Until not long ago, over half of the world’s oil production was coming from here, and although such oil rigs are now exhausted, there are many others off-shore producing enormous amounts of petrol, and as everyone known, a petrol-rich country means wealth and money, yet not for everyone of course, but from the perspective of a tourist visiting the city it is a very clear show-off on what money can do and build. So while the historic walled city is a masterpiece of Oriental and local architecture listed as a whole an UNESCO World Heritage Site, the expanded city beyond the walls is a luxurious display of elegant late 19th and early 20th century architecture in various styles, mostly art-nouveau and neo-classical. And beyond, in the new areas created and the ones gained to the sea, the new display of 21st century architecture from world renowned architects in towers, museums, concert halls, malls and landscaping. For more information about Baku check Wikipedia site. Azerbaijan’s currency is the. Please note that any price reference is true as from when this guide was created, therefore check prices in advance as with the time they change. Huseyn Javed Square At the northwest on one of the hills over the city, home to the Baku University and ministries housed in elegant old buildings surrounded by a square, gardens and fountains. It is served by the Elmlar Akademiyasi metro station. Flame Towers Designed by HOK Architects, it is the new symbol not just of the city but the entire country. A trio of skyscrapers resembling burning flames, spectacular during the day and the night when illuminated. From the previous square, is easy to reach along Huseyn Javed to the south and onto Parliament Avenue to the end. Parliament Building Right across the Flame Towers, built in pure Soviet style. Martyr’s Alley and Highland Park Built to commemorate the 130 victims killed as a result of Black January 1990 at the hands of the Soviet military attacks. The park offers great views over the bay of Baku and the city down below. Funicular Linking the Highland Park upper station with the base station near the sea promenade and the old historic town. Azerbaijan State Philharmonic The main concert hall in Azerbaijan built in 1912, in the Italian Renaissance and German Rococo styles, with a design inspired by the Opera of Monte Carlo. Philharmonic Gardens All around and behind the Philharmonic building itself, this beautifully landscaped garden divides the area from the walled old town. Teze Bey Hamam The most famous of the many hamams in the city. Dating from 1886 yet recently restored and upgraded, it’s a great piece of architecture inspired in the Oriental, Russian and Finnish baths. Located in Şeyx Şamil Küçəsi street, off Istiglaliyyat Street near the Icheri Sheher metro station. Istiglaliyyat Street Completely surrounds the old town from the western boundary. One of the most elegant streets in the city with great late 19th and early 20th century architecture, not only along this thoroughfare but on the parallel and perpendicular ones too. Almost every building is worth a sight such as the Western University, the Icheri Sheher metro station, City Administration, State Economic University, Institute of Manuscripts or the Ismailiyya Palace, one of the most impressive richly decorated buildings in the city from 1913 in Venetian neo-Gothic style. Fountains Square Also referred as its older name, Parapet. While not just a square but a neighborhood in full, its name comes from the many fountains dating from the Soviet period and the newer added more recent. Most of the boutique hotels, up-scale shopping, restaurants and bars are in this area. It is the northeastern-most terminus of Istiglaliyyat Street. Nizami Street The most famous and mostly pedestrian shopping, residential and tertiary street in Baku, completely surrounded by beautiful architecture in the buildings, thriving day and night. Runs parallel to Istiglaliyyat Street, passes through Fountains Square and continues beyond into the elegant extension of the city, where the streets follow an orthogonal grid pattern. -State Academic Opera and Ballet Theater Built in 1911 in modernist style. -National Library Right across the Opera building. Icheri Sheher The Old Town or Walled City, the major tourist attraction in the country for containing and almost unchanged medieval fabric since its construction, combining the oriental with local styles. It’s been listed an UNESCO world Heritage Site. Palaces, fortress walls, minarets, mosques, bazaars, caravanserais, bath houses, schools and more, all carefully kept and restored. -Maiden Tower Built in the 11th–12th century, recognised as the symbol of the city, listed on its own as an UNESCO site. Flanks the eastern boundary of the walled old town. -Palace of The Shirvanshahs Built in the 15th century by Shirvanshah dynasty who transferred the capital from Shemakha to Baku. It is considered the pearl of Azerbaijan’s architecture, and listed on its own an UNESCO site. The Promenade All along the Caspian Sea, it is a landmark of the city of Baku, with its many beautiful gardens, monuments, sculptures; and new recent architectural icons adding to the skyline. -Crystal Hall An indoor arena completed in time for the 2012 Eurovision Song Contest that here took place. Located at the southwestern-most end of the promenade. At night there is a LED light display across the entire facade. -Carpet Museum Quite of an interesting and different museum, whether you step inside or not, the outside architecture of the building is stunning. -Canal of Baku Venice Meters north from the Crystal Hall, these gardens have been landscaped to resemble canals in between buildings. -International Mugham Center These buildings are part of the same canals project. Its aim is to promote, preserve and popularize mugham, the specific Azerbaijani music genre. -Pier From where to get great views of the bay and the city in the background. -Parachute Jumping Tower Although not in use for many years, it was built by the Soviets in 1936 and remains a landmark ever since. -Business Centre Again, listing it only here because of the nice architecture in its design. Freedom Square The northeastern end of the Promenade is flanked by this large square, the main one in the city where the massive Government House is. Heydar Aliyev Center One of the landmark constructions in the city, designed by architect Zaha Hadid as an auditorium, gallery hall and a museum. As it’s not within an easy reach from the city centre by walking, you will need to get on a bus, or the metro to Nariman Narimanov station and walk few mins from there. SOCAR Tower The tallest building in the Caucasus, completed in 2016 for the State Oil Company of Azerbaijan Republic. Another of the new landmark constructions with its twist architecture. Not far from the Heydar Aliyev Center, and Nariman Narimanov metro. Outside of the city While there is not much to see in the country once you are outside of the capital city, there are still some interesting places, most of which are at easy reach from Baku in the nearby. -The Ateshgah of Surakhani (The Fire Temple) East of the city in the Absheron Peninsula, easily reached by public transport, commuter train (Surakhani station) buses or shared micro buses (marshrutka 191 from Qara Qarayev metro station). Built in the 17th century, used as a Hindu, Sikh, and Zoroastrian place of worship through its history. -Yanar Dagh The mountain that has been on fire for over a thousand years continuously due to the gas that comes from the natural vents below. Located north outside of Baku beyond Boyukshor Lake. Take bus 217 from Koroglu metro station. The last stop is Yanar Dagh. -Petroglyphs of Gobustan Some 50 km to the southwest of Baku. Dating back as far as the 12th century BC, they form the greatest collection in the world of such kind. -Mud Volcanoes Azerbaijan having alone almost half of the world’s total, you will pass by some of these when moving anywhere near Baku, especially to the south direction towards Gobustan area. Heydar Aliyev International Airport is the main gateway to the city and the country. More and more airlines provide direct connection within Europe and beyond, with plenty others coming at a fast pace. From the airport and while the extension of the metro takes place, there is a very convenient airport express bus to downtown, to 28 May where you can connect to both metro lines and the public city buses. The journey time is around 40 minutes, with departures every 30 mins and every hour during the late night hours, 24 hours a day. Once in the city, there are 2 metro lines built during the Soviet times, hence expect a proper Soviet metro with extensively decorated stations, very deep and very functional. Public buses cover the entire city and its neighborhoods, very cheap and reliable. A small funicular links from the base station next to the old town to the upper district near the Flame Towers. Walk-wise talking, the city is perfect for visiting on foot and enjoy most of the sights long the way. It is rare the need for taking any public transport, unless for reaching the farther areas. The walled old town is very small and extremely compact, with such a narrow streets that no buses can even access, while the districts surrounding it have wide avenues and boulevards. Finding a nice deal should not be difficult in Baku, bearing in mind the enormous and continuously growing tourism in the city. New large properties are being opened frequently, with some being really grand hotels. You have the entire range here, from the more modest to the superb luxurious and anything in between. The best you can do in order to search for a good deal is checking some of our preferred affiliate hotel search engine such as Hotels.com, Booking.com, Expedia, Otel.com, Agoda, Opodo, LateRooms or Ebookers. We stayed at the Renaissance Palace Baku, located at I. Gutgashinli Street, number 107. This is not far from the metro station Elmlar Akademiyasi and one of the principal arteries of the city with buses all over. It is a nice property, highly recommended for the size of the rooms, overall care and cleanliness and facilities; however bear in mind about their pool, bubble bath, steam room, sauna and gym. All is located within the same area but guests are not really “free” to roam around whenever they like. Instead, you need to book that space at your desired time, and no one else can get inside. Not ideal to be honest, since we faced some days where it was already booked and could not use it ourselves, when clearly there is plenty of space and room for more people to use it at once. Consider it as kind of private spa facilities, yet free of charge. Plan ahead and book a time slot to avoid disappointment. Other that this all went well for our stay. This entry was posted in 01. Europe, 07. October, 2018, Azerbaijan, Big Trips, Caucasus and tagged Azerbaijan, Baku, Caucasus, East Europe, Europe. Bookmark the permalink.